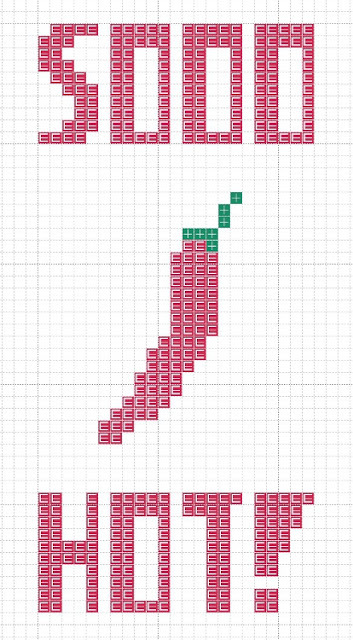 This is a red hot chili to cross stitch for the hot thing in your life. Or maybe you want to stitch it for your self just to remind people that you are, in fact, the hottest of them all. It is free to download and use for your personal stitching pleasure. Share it! Pin it! Tweet it! If you don't fancy looking at your computer to read the chart don't worry. You can download the full size. Then you can open it in your application of choice because it is a JPG. And Print it! You only need two colours for this one. Green and HOT HOT Red!